Our continuing series moves on as we look at a different variation of the WaterMark theme. Calm, cool, elegant, this week we let a rolling hillside guide our design mindset. And it sure was brown. These themes all utilize a background with a strong pattern or detail in the header, and slowly transition into a simple colour by the end of the page. This makes for great eye-catching right off the bat, and also allows for uninterrupted scrolling. As we change templates, nothing really changes, save for the background. 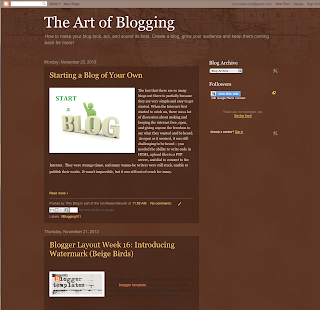 Enjoy a field of grass this week and join us every Thursday as we discuss and use a new template for Blogger. Dont forget to Follow us on Facebook!